It's a grim time for big-screen superheroes. Rebooted versions of Superman and Spider-Man both have daddy issues. Tony Stark has PTSD. Wolverine kinda wants to die. So it's a relief to watch Thor: The Dark World, which is the lightest, funniest superhero movie in ages. Let a thunder-god show you how to make a joyful noise. Actually, if you're worried about being spoiled for Thor 2, the clips below (all released by the studio) give away much, much more than this review will. I'm including them because they give a flavor of what this film is like. Ostensibly, Thor: The Dark World is about a Dark Elf named Malekith (Christopher Eccleston) who wants to extinguish all light in the universe because he's still pissed about the Big Bang or something. (This is the highest stakes of any Marvel film thus far.) Thor's grandfather stopped him back in the day, but now he's back. But really, Thor 2 is about two relationships: Thor and his step-brother Loki, and Thor and his physicist girlfriend Jane Foster. Pretty much the whole film revolves around Thor's interaction with those two people in his life. Loki is locked up after his actions in The Avengers, and Thor has to team up with him to try and stop Malekith, giving us lots of scenes of the two working through some of their issues. Meanwhile, Jane Foster has been waiting for Thor to come back after the first movie, and when she goes to Asgard it's not clear that the incredibly long-lived Thor can have a relationship with a mere mortal, or whether she can play an important role in his world. Both of these quandaries — whether Loki is just a monster, whether Jane is just a damsel in distress — are handled with tons of humor. The writing in Thor 2 is very self-aware, full of characters commenting on their situations (but nobody ever winks at the audience or seems less than committed to the reality of the world.) A lot of this humor was there in the more down-to-earth Thor, too — but this time around, it's combined with seat-of-your-pants adventure, giving the whole thing a bit of an "80s action movie" feel. Thor: The Dark World is super funny. It's one of the funniest movies we've seen this year, and it's also pretty much non-stop zany action. To some extent, Thor is the straight man surrounded by wry jokers — but Chris Hemsworth brings his own understated sort of wisecracking, as well. And this film doesn't really need a straight man, as such — at this point in the collective Marvel movie saga, they're banking that you're along for the ride, even if it gets a bit silly. Malekith's plan to snuff out the universe depends on a convergence of the nine realms, which include Asgard and Earth — and this convergence weakens the walls of each reality, creating mini-wormholes. These "anomalies" set up a lot of great sight gags, especially as the film goes on, but they also help to cement the idea that Thor's universe is unstable and that he needs to be strong to hold it together — and that his relationships with all the characters, not just Loki and Jane, are the fixed points in Thor's world. This movie does a pretty good job of making you feel the weight of being Thor and having to protect nine realms from quasi-D&D monstrosities, but also lets you see how the people in Thor's life give him strength. That said, Thor: The Dark World isn't quite my favorite recent movie — the plot really is completely forgettable, and Christopher Eccleston is basically a non-entity as Malekith. Anthony Hopkins, too, is barely showing up as Odin, Thor's father, at this point. The film might be a little too lightweight for its own good, since I had to watch a bunch of clips to remind myself of crucial stuff that happened. And Thor: The Dark World also feels a little bit meta, at times. Like, this movie knows it's the eighth movie in the interconnected Marvel saga, and at this point everybody knows the drill. Random bystanders all know about Thor from The Avengers and the business of zipping between different CG-enhanced fantasy worlds feels a little bit like a nod to the artificiality of it all — as does Loki's habit of playing with funny illusions, which at times become allusions to other films. 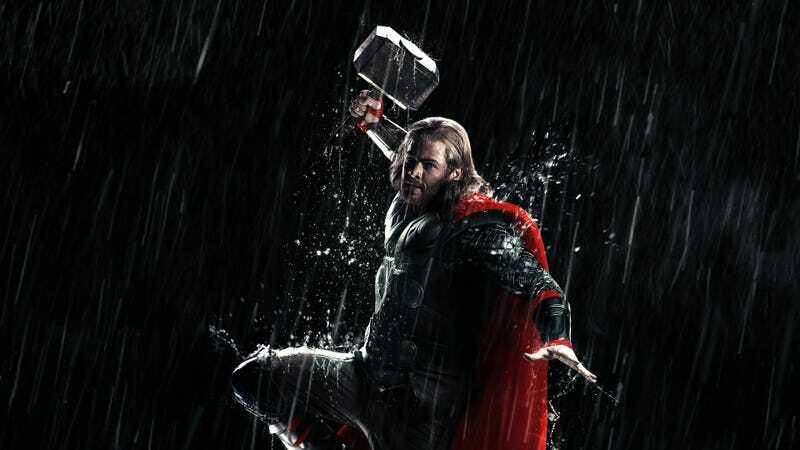 But still, Thor: The Dark World is the most fun we've had at a superhero film in ages. And at a time when superhero films are gravitating towards Christopher Nolan-style darkness, it's really nice to see a movie go swinging into adventure with a song in its heart. A lot of superhero movie-makers seem to struggle with the gnawing fear that if they embrace the fun or the four-color brightness of costumed heroes, the movie will immediately turn into Joel Schumacher's Batman and Robin. And Thor: the Dark World (along with bits of Raimi's Spider-films) ought to dispel that notion. In fact, Thor: The Dark World is witty, rather than campy. The humor is, if anything, underplayed — but it's so funny, it still carries the movie. The larger-than-life costumes actually work amazingly well with the low-key but good-natured performances. You don't need to play big if you're wearing a giant helmet, it turns out. A lot of credit for the movie's successful embrace of humor in the midst of larger-than-life settings and costumes has to go to director Alan Taylor, who uses his experience on Game of Thrones to make places like Asgard and the Dark World feel as real as London in the film. It feels as though Taylor is using CG and handheld cameras in a similar way to Zack Snyder, but without the same monastic slowness. Instead, Thor: The Dark World is light on its feet. It's, in some sense, an old-school action movie, bringing back the fun that's been missing a lot lately — but it's also maybe the way forward for superheroes, showing the path out of darkness.